As part of the new DIYBio network in the Nordic and Baltic region the Bioartsociety organizes the network kickoff with a workshop by Andrew Gryf Paterson from 29th to 31st of August at TEMPORARY in Helsinki. The workshop is also a partner event with the Arts in the Environment Nordic Symposium taking place from August 31 – September 2, 2017 at various venues across Helsinki. 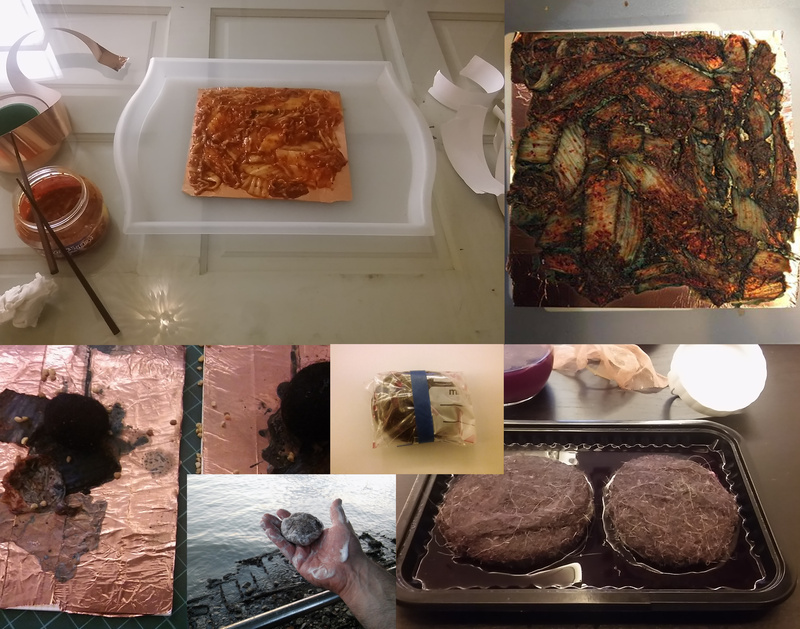 Andrew writes about the workshop: "I started Copper-Kimchi combination experiments at the end of 2015, start of 2016, within the context of the Ferment Lab Taipei/Helsinki project, initiated by Agnieszka Pokyrwka, intuitively bringing together typically unrelated biological, metal-mineral and naturecultural materials–Copper, Felt and fermented vegetables Korean-style to intra-act with each other. Despite my involvement with them, simple biochemical processes such as lacto-oxidisation, adsorbtion, discolourisation, hydration and dehydration took place. These process produced a curious outcome, and gives material and knowledge -inspiration for reflections on contemporary issues in the bio-commons." This workshop and discussion based events aim to mix practical hands on work to develop social rapport, fermentation and meditative reflections within the newly formed DIYBio network, and give opportunity to connect with current and topical debates in the European Bio-Commons scenes. The workshop will take place at TEMPORARY, a sandbox for practice-based research into experimental interactive formats in Helsinki and you can sign up for the workshop here. The DIYBio Network and series of activities are supported by Nordisk Kulturkontakt Short-term Network fund. Introductions between DIYBio Network participants. Update on the bio-commons, politics & ethics debate. Social catchup, chop and salt cabbage to ferment overnight. Exercise for 30mins arranging pre-made kimchi on copper items, e.g. copper-tape, other copper made containers or items, as an installation (this could be shown later in ‘Art in Environment’ Nordic symposium/exhibition. Potential discussion re: about metalic commons, and copper-based chemical compounds. Exercise for 1hr making a liquid form out of previously-made-earlier Copper-Kimchi substance that is dried. Over time the kimchi lactic-oxidizes the copper, producing a Copper-Oxide or Cupric Lactate substance, variously blue-green-black in colour. Dissolving and blending matter into a liquid form, straining with gauze the liquid to produce ink that can be used to paint or draw with. Potential discussion re: knowledge & cultural commons (natural and synthetic dyeing traditions), Processed food industry, fairtrade or ecological practices, compound minerals, biochemical commons in developing world context, transcultural & transmaterial exchange. Exercise for 1.5hrs making portraits of each other and/or lactobacillus (depending on bacterial visualisation technologies available). Potential discussion re: Wrap-up discussion related to Bio- commons, and next actions in the DIYBio network.